Map 2 begins with a reminder that formal therapy and alliance building continue to occur simultaneously throughout treatment. 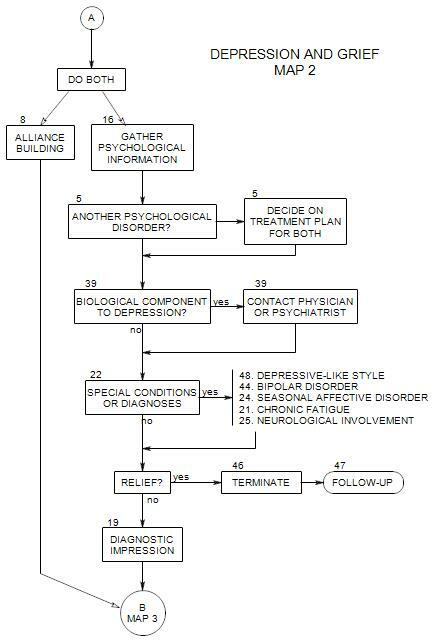 Section 8 continues to describe alliance building, and the next treatment step is to gather information. Section 16 discusses that aspect.The map continues to examine depression as derivative of other issues – another psychological disorder [Section 5] or a biological condition [Section 39]. It then considers some sources or types of depression that may respond to specific treatments [Section 22]. If the patient’s depression continues, this is a good time to review your diagnostic impression [Section 19] and continue on to Map 3. If the patient’s depression is relieved, it may be time to terminate [Section 46]. If you do terminate the patient, you can also plan for a follow-up [Section 47] at a later time.